Arthropod pests or diseases cause a variety of damages to crops. Some by reducing plant vigor resulting in lesser yields and some by causing direct damage to the produce which can be unmarketable due to deformity, unpleasant taste, damaged tissue due to insect feeding, presence of insects and/or frass, decay due to secondary infections, and other factors. It is quite understandable when the produce is not accepted because of the taste or potential health risk. For example, citrus fruit with huanglongbing or citrus greening disease transmitted by Asian citrus psyllid gives a bitter taste to citrus juice. 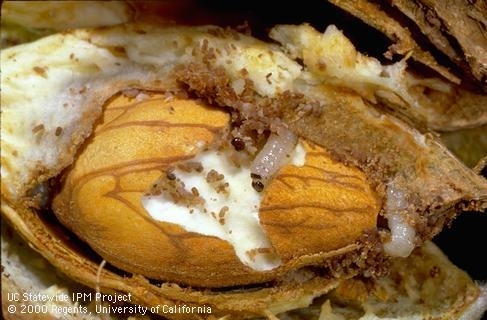 Navel orangeworm larvae bore into almonds and feed on the nut causing complete or partial damage and leave frass and cause fungal infections. 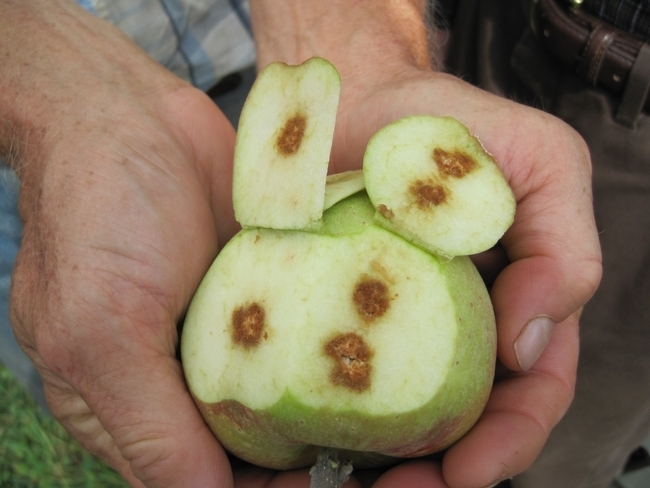 Brown marmorated stink bug damage on fruits and vegetables change the texture and taste of the damaged area. Such damage certainly makes the produce unmarketable and applying pesticides or administering other control measures to prevent the damage is warranted. On the other hand, certain damage is only cosmetic with no reported change in taste or quality of the produce. One example would be fruit deformity caused by the lygus bug in strawberries. Strawberry is a high value fruit appreciated for its taste, shape, color, and flavor. Lygus bug feeding on young green berries results in uneven growth and deformity of mature berries. 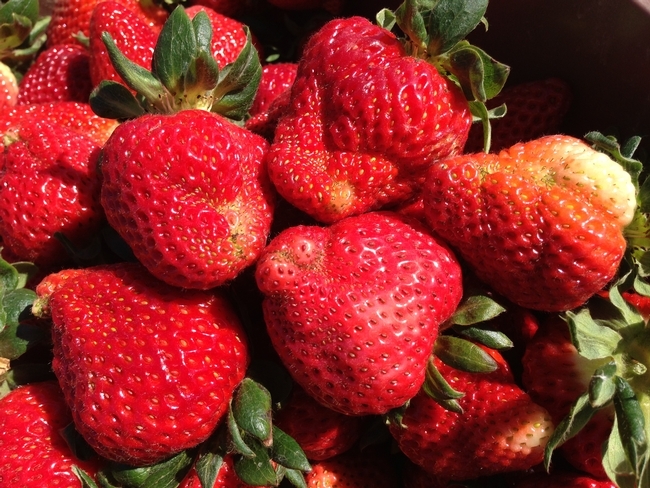 While there is no record of the impact of lygus damage on strawberry fruit quality, millions of pounds of pesticides are applied to control lygus bug or similar pests that cause cosmetic damage in strawberries and other crops. The preference of consumers for perfectly shaped fruits and vegetables creates a need for intensive pest management practices and results in associated financial and environmental costs. Since chemical pesticides are generally economical and effective tools to manage pests, they are widely used. The overuse of certain effective pesticides causes development of resistance in pest populations. This, in turn, leads to increased use of the same or other pesticides. Excessive use of chemical pesticides can have a harmful effect on beneficial arthropods resulting in secondary pest outbreaks. Organic agriculture is gaining popularity due to environmental and human health concerns from chemical pesticide use. “Organic agriculture produces products using methods that preserve the environment and avoid most synthetic materials, such as pesticides and antibiotics” according to USDA. But organic agriculture is not necessarily the only sustainable solution. Before agricultural industrialization, there was a better balance between pests and their natural enemies (beneficial arthropods such as predators and parasitoids that attack pests). Once agriculture was industrialized, thousands of acres of monoculture now provide an unlimited supply of food for a variety of pests. When the natural balance is disrupted, natural enemies alone are not sufficient to manage pest populations. This is where an Integrated Pest Management (IPM) strategy plays an important role in bringing a sense of balance into pest management. IPM employs multiple tools that include selecting resistant varieties, modifying planting dates, changing irrigation and nutrient management practices, conserving or releasing natural enemies, applying chemical, botanical, and microbial pesticides, or using mechanical tools. Each of these tools contribute to reducing pest numbers, complement each other, and result in pest management in an environmentally sustainable manner. Organic agriculture, on the other hand, relies on biopesticides instead of chemical pesticides, which can sometimes be less effective or slow in achieving desired control. For example, an effective chemical pesticide with a specific mode of action could kill pest populations within a few hours of application. However, using a biopesticide based on an insect-pathogenic microorganism like the bacterium Bacillus thuringiensis or the fungus Beauveria bassiana, can take a few days to allow the microorganism to infect and kill the pest. When pest numbers are low, non-chemical solutions may provide required control to minimize damage. However, with heavy pest infestations, chemical pesticides are often needed to provide timely control that prevents further buildup of pest populations and the resulting damage to crops. Organic agriculture is expensive because of generally higher losses due to pests and higher cost of agronomic and pest management practices. Sometimes, ineffective control of pests on organic farms may result in their spread to neighboring fields and increase the risk of pest damage. Organic agriculture does not mean pesticide-free farming, and biopesticides used on organic farms also require safety guidelines similar to chemical pesticides used on conventional farms. Organic agriculture may require a higher number of pesticide sprays increasing the risk of exposure for workers. In some pest and disease situations in certain crops, organically registered products are not available and yield losses could be higher. Exporting organic produce, in light of exotic and invasive pests spreading to other areas, is also a challenge due to limited options for shipping organically produced pest-free fruits and vegetables. Using cultural practices to reduce the risk of pest infestations and applying biopesticides when pest populations are low and chemical pesticides when populations are high can be components of an IPM strategy where multiple tools are exploited in a balanced manner. Combining and rotating chemical pesticides with non-chemical alternatives strengthens the effectiveness of IPM by providing desired control without the excessive use of chemicals. Chemical pesticides can be used during early stages of the crop growth while biopesticides can be used closer to harvest. Considering the challenges and risks associated with organic agriculture and the practicality of IPM-based agriculture, a couple of ideas could be worth pursuing to maintain environmental and human health, reduce harmful chemicals, and ensure food security for the growing world population. Acceptance of imperfect produce: When consumers are tolerant of imperfectly shaped fruits and vegetables with no health risk from pathogens or arthropod pests, a significant amount of pesticides of all kinds could be avoided. This would translate into saving millions of dollars otherwise spent on pesticides and their application costs, and money earned on selling otherwise unmarketable produce. This may also reduce the disposal of unpicked produce at the grocery stores. When consumers accept imperfect fruits or vegetables, the cost of produce, both to produce and purchase, could come down. I recently came across Imperfect Produce, a company that sells imperfect produce and End Food Waste, an organization that started the Ugly Fruit And Veg Campaign. 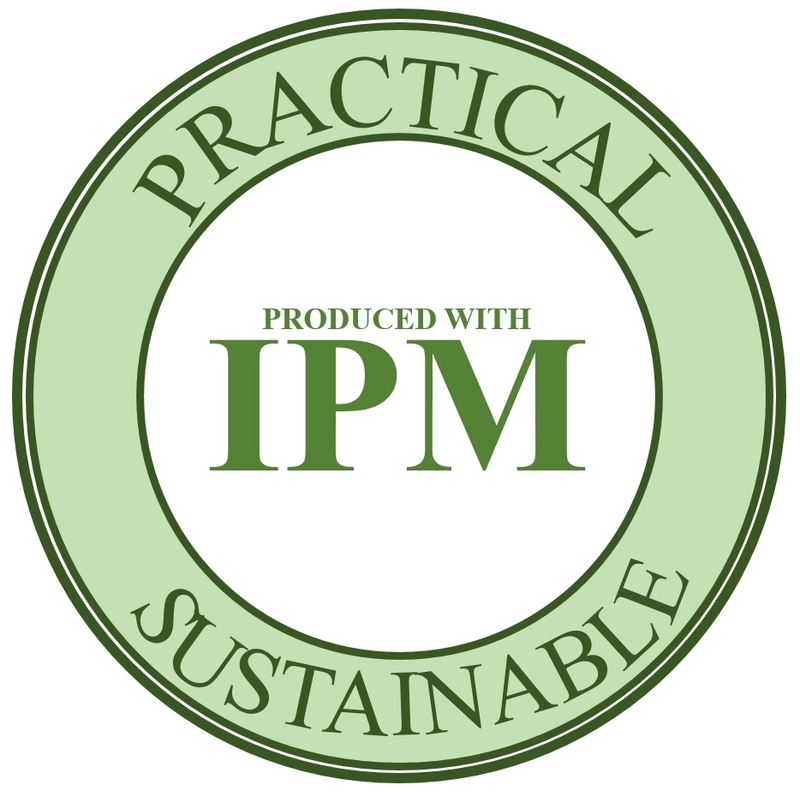 IPM: Considering the difficulty in ensuring food security exclusively through non-chemical agriculture for the growing world population (projected to be 9.6 billion by 2050), IPM is an effective, practical, and sustainable tool that uses a balanced approach. 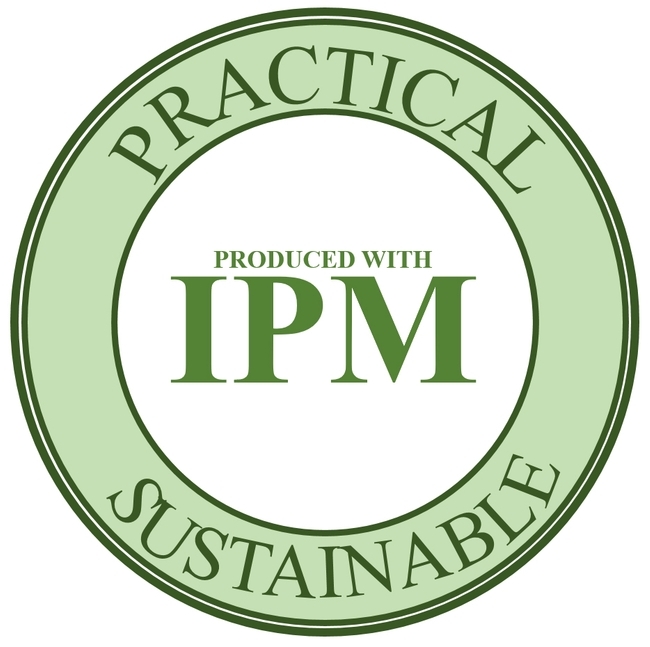 While organic agriculture is encouraged and supported, and there are several organizations that certify organic production around the world, IPM hasn't caught the attention of marketers yet. Perhaps a seal of IPM should be considered and promoted in the near future. Opinions expressed in this article are my own and based on my experience in IPM, microbial control, biological control, and from discussions with several growers and scientists.